An affordable-housing nonprofit has stepped forward to take over the Ballard home that’s widely celebrated for its statement against development. 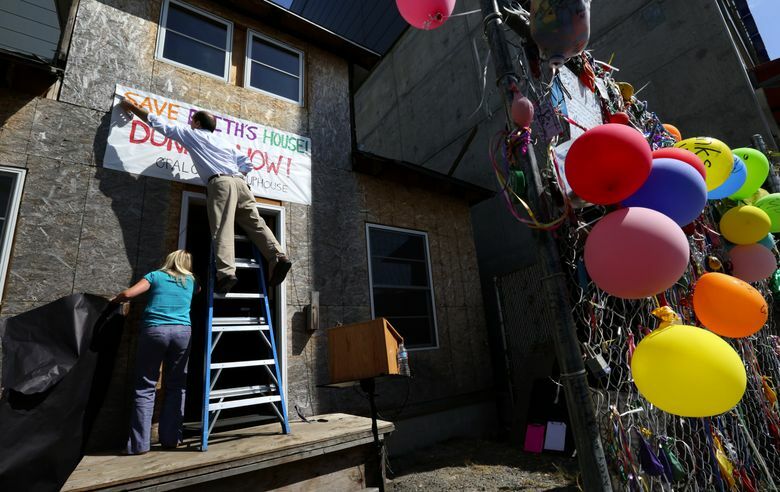 An affordable-housing nonprofit Tuesday announced plans to move and sell the Ballard house once owned by Edith Macefield that’s been a longstanding symbol of anti-development in a neighborhood booming with commercialization. Owners have donated the so-called “Up” house to OPAL Community Land Trust, which is launching a $205,000 Kickstarter fundraising effort to help move it by barge to Orcas Island and renovate it for a family to live in. Additional money to pay for the project would come from other sources. Nicknamed after the 2009 Pixar film, the house is wedged between towering concrete walls near the Ballard Bridge and has been celebrated for Macefield’s fight against demolition. The future of the foreclosed home has been in limbo since Macefield’s death in 2008 at age 86. Potential buyers have been unable to afford the renovations to keep the structure in line with city building codes, broker Paul Thomas said, and its fate has come down to two options: demolition or relocation. If OPAL can’t raise the money by Sept. 15 to cover the home’s lift onto the barge, move across water, restoration and land, the nonprofit will step away from the project, continuing the home’s uncertain fate. Macefield at one point reportedly declined an offer of more than $750,000 to leave the tiny house, and her story has been widely celebrated as a statement of beating big-name development on a busy block now populated with a grocery store, gym, tanning salon and other commercial spaces. For 50 years, Ann MacLean said, she’s driven by and watched the home’s backdrop change. The longtime Ballard resident Tuesday added a personalized balloon to the dozens of others that fans have attached to the home’s chain-link fence. Covered in plywood on the outside, renovated with new framing on the inside, the home’s structural condition makes it worth the effort to move, said Jeanne Beck of OPAL. And generally, relocating houses is a more cost-effective option than building new, she said. She said plans are that, once relocated and renovated to look like Macefield’s original design, the home would sell for about $180,000. OPAL has relocated 10 houses in recent years, five of which were similarly moved by barge from the Seattle area to Orcas Island. The nonprofit, which was one of a handful of organizations that submitted proposals to take over the project, typically relies on donations and grants. This is its first kickstarter campaign. Thomas said none of the proposals came from groups in or near Ballard; the closest was from West Seattle. He said many developers have shown interest in purchasing the home’s property, but it’s too early to know what will happen to the land if the home moves. Josh Hemsath, who made a point to visit the Seattle home while on vacation from Anchorage, Alaska, said though the house’s character would stay preserved with the move, it is bittersweet to think about its leaving the neighborhood it helped define. “I don’t know that chain stores (and) identical concrete buildings necessarily reflect a century-old neighborhood that has a rich history,” he said.